Lupinus pusillus Pursh var. intermontanus (A. Heller) C.P. Sm. Habit: Annual 0.5--1.2 dm, hairy; cotyledons disk-like, persistent. Leaf: cauline, crowded near base; petioles 3--6 cm; leaflets 5--6, 10--20 mm, +- 5 mm wide, adaxially glabrous. Inflorescence: +- 3 cm, < leaves, dense, flowers spiraled; peduncle 0--1 cm; pedicels < 1 mm; bracts +- 3 mm, straight, persistent. Flower: 6 mm; calyx upper lip +- 2.5 mm, lower +- 5 mm; petals pale blue, fading +- pink or +- white, banner spot white or yellow, keel glabrous. Fruit: 1.5 cm, 6 mm wide, oblong, narrowed between seeds, hairy. Seed: 2, wrinkled, margin ridged. Chromosomes: 2n=48. 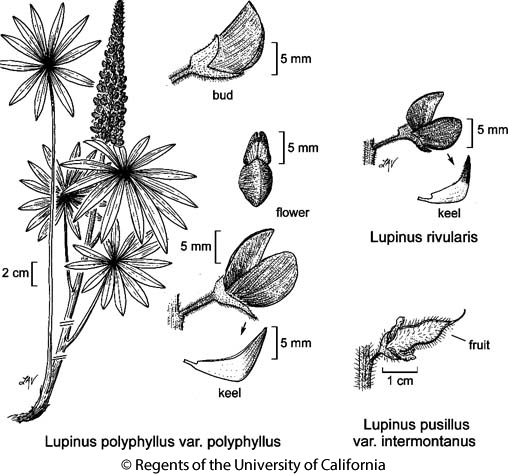 Citation for this treatment: Teresa Sholars & Rhonda Riggins 2012, Lupinus pusillus var. intermontanus, in Jepson Flora Project (eds.) Jepson eFlora, http://ucjeps.berkeley.edu/eflora/eflora_display.php?tid=61437, accessed on April 22, 2019. GB (Modoc, Inyo cos.); Markers link to CCH specimen records. Yellow markers indicate records that may provide evidence for eFlora range revision or may have georeferencing or identification issues. Purple markers indicate specimens collected from a garden, greenhouse, or other non-wild location.